Sulzeer Jeremiah Campbell (born 18 September 1974) is an English professional football manager and former player who is the manager of League Two club Macclesfield Town. A central defender, he had a 20-year career playing in the Premier League and an 11-year international career with the England national team. Born in east London to Jamaican parents, Campbell began his career with Tottenham Hotspur in December 1992. He spent nine years at Spurs, scoring 10 goals in 255 appearances, and captaining the team to victory in the 1999 Football League Cup Final against Leicester City. In 2001, he joined Tottenham's North London rivals Arsenal on a free transfer, and as a result has remained a deeply unpopular figure amongst Spurs supporters. In his five years and 195 appearances at Arsenal, he won two Premier League winners medals and two FA Cup winners medals, encompassing the 2001–02 league and FA Cup double, and being part of the team that became known as The Invincibles for their undefeated 2003–04 Premier League campaign. He scored Arsenal's only goal in their 2–1 defeat to Barcelona in the 2006 UEFA Champions League Final. In August 2006, he joined Portsmouth on a free transfer. His three years with the club included captaining them to victory in the 2008 FA Cup Final. At the end of the 2008–09 season, he made the surprise move of dropping down three levels of the English football pyramid to join League Two side Notts County on a free transfer. He left the club by mutual consent in September 2009, having played just one match for the club. The next year, he made a brief return to Arsenal before ending his career with Newcastle United. Having already won caps for the England under-21s and England B team, Campbell gained his first of 73 full caps for England aged 21. In May 1998, Campbell became what was then England's second-youngest captain, after Bobby Moore, aged 23 years 248 days. In 2006, he became the only player to have represented England in six consecutive major tournaments, playing in the 1996, 2000 and 2004 UEFA European Championships; and the 1998, 2002 and 2006 FIFA World Cups. He was named in the Teams of the Tournament for the 2002 World Cup and at Euro 2004. Other honours in the game include being in the PFA Team of the Year three times, in 1999, 2003 and 2004. In February 2015, Campbell announced his intention to run for the Conservative Party nomination for Mayor of London in the 2016 election. He was not selected as the Conservative candidate. Campbell was born in Plaistow, London, to Jamaican parents Sewell and Wihelmina. He was the youngest of twelve children, nine of whom were boys. His father Sewell was a railway worker and his mother Wihelmina was a Ford factory worker. Despite growing up in a rough neighbourhood to a family with very little money, Campbell veered away from a life of crime due to his strict parents. I became a recluse within my own house. I became insular because at home there was no space to grow or to evolve, everything was tight and there was no room to breathe. People don't realise how that affects you as a kid. I wasn't allowed to speak, so my expression was football. —  His father paid little to attention to him other than to discipline him, and so Campbell grew up to be quiet and polite, but also isolated. Campbell attended the Portway Primary School in Plaistow, London and had secondary education at Lister Community School in Plaistow, London. He was a prodigious schoolboy talent and was part-educated at the FA's School of Excellence at Lilleshall, where he met table tennis player and later football agent Sky Andrew. Campbell had a short spell at West Ham United, beginning his career as a striker. He left the Youth programme at Upton Park after a coach joked to him that Campbell would be pleased to hear that the West Indies were beating England at cricket; Campbell took this to be offensive. Following his experience at West Ham United, Campbell was reluctant to join another professional club's youth programme, but after two months of persistence from Tottenham Hotspur's chief scout Len Cheesewright, he eventually joined the Tottenham Youth team. Youth team manager Keith Waldon later recalled that it was his physicality rather than his technical ability which made him stand out as a good prospect for the future. At age 14, he was one of only 16 young footballers accepted onto a training programme at Lilleshall Hall. Waldon offered to make him captain of the youth team, but Campbell declined the offer as he wanted to concentrate on his own game. Campbell made his first team debut for Spurs on 5 December 1992 against Chelsea at White Hart Lane, scoring the goal in a 2–1 defeat after coming on as a substitute for Nick Barmby. Despite this start to his career, he was not picked by manager Terry Venables again throughout the remainder of the 1992–93 season. New boss Osvaldo Ardiles played him at left-back at the start of the 1993–94 season in place of the injured Justin Edinburgh, before he was switched to right-back in place of Dean Austin. At the end of the season, he signed a four-year contract with the club. New manager Gerry Francis led the club to the semi-finals of the FA Cup in the 1994–95 campaign, but Campbell missed the match due to injury and Spurs were beaten by Everton. Campbell continued to progress in his performances, but Spurs struggled to mid-table league finishes in the 1995–96 and 1996–97 seasons. Francis appointed Campbell as club captain, taking over the role from the out of favour David Howells. He had a strained relationship with short-lived manager Christian Gross during the 1997–98 season as Spurs again struggled. Gross's replacement, George Graham, also had a difficult relationship with Campbell. Campbell successfully captained his side to a League Cup final win over Leicester City in the 1998–99 season. this made him the first black captain to lift a major trophy at Wembley Stadium. He was also named on the PFA Team of the Year, as was teammate David Ginola. The League Cup success qualified Spurs to compete in the UEFA Cup during the 1999–2000 campaign, but they only made it into the Second Round before they were beaten by German side 1. FC Kaiserslautern. During this time, he was falsely accused of breaking a stewards arm during a scuffle in a game at Derby County, and refused Tottenham's lawyer's advice to have the case Bound over (meaning he would not be convicted but would effectively have admitted some level of wrongdoing), and was subsequently told by the club to field his own legal defence for the case. The case was later dismissed. The club's lack of progress in the league, his poor relationship with recent managers and the club's lack of support during the assault case left Campbell feeling disillusioned with Spurs. 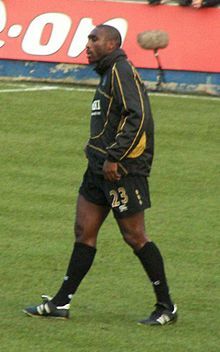 Campbell missed three months of the 2000–01 campaign after dislocating his shoulder in a 0–0 League Cup draw with Brentford at Griffin Park. He made his final appearance for the club in the FA Cup semi-final defeat to Arsenal at Old Trafford. Manager Glenn Hoddle admitted it was a risk to play Campbell as the defender was not at full fitness, and he injured his ankle fouling Ray Parlour before he was eventually replaced by Ledley King. However, before the substitution could be made, Patrick Vieira scored a header for Arsenal while Campbell was off the pitch receiving treatment. In the summer of 2001, Campbell's contract expired. Mindful of the Bosman ruling and what happened with Steve McManaman (Britain's first high-profile Bosman related transfer), Tottenham offered him a contract which would have made him the club's highest-ever paid player, but after months of negotiations and several public assurances he would stay at Spurs, Campbell stated his need to leave the club in order to play UEFA Champions League football, with the likes of England manager Sven-Göran Eriksson advising him of such a course. Several top continental clubs expressed interest in signing him, but he joined Arsenal – Tottenham's biggest rivals – on a free transfer. Campbell had previously stated in an interview with Spurs Monthly magazine that he would never play for Arsenal. The move was also unusual as no rumours of a move to Arsenal had been leaked or speculated upon in the media before the press conference revealing his decision, and many journalists in attendance had been led to believe they were there to witness the unveiling of goalkeeper Richard Wright, which would have been a routine sports news story. Campbell has been labelled "Judas" by some Spurs supporters. Years later, the anger from Spurs supporters remained. In January 2009, four Tottenham fans were banned from every football ground in England and Wales for three years after being found guilty of chanting an offensive song containing indecent language (with homophobic content and content which some observers interpreted as racist) aimed at Campbell. [Arsenal vice-chairman] David Dein made me feel protected. He was going to help and promised to be there for me. Come to us, he said, and you will be part of our family. We will protect you. —  Campbell chose to sign for Arsenal for the same reasons he left Spurs. Not only were Arsenal more likely to compete for honours, but they also promised to firmly support Campbell. 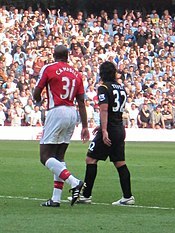 Campbell on his second spell at Arsenal in 2010 with Carlos Tevez. Arsène Wenger later said he signed Campbell as he found that when playing against him, his attackers could not pass him like they could other players and that "it was as if he was indestructible, such a power spread from him". He made his debut for the "Gunners" on 18 August – the opening day of the 2001–02 Premier League season, in a 4–0 win over Middlesbrough at the Riverside Stadium. During the season, Campbell was partnered at the back by either Tony Adams (who would retire at the end of the season) or Martin Keown. He made a return to White Hart Lane during a 1–1 draw on 17 November, and though he played well, he was shocked to see his older brother Tony in the crowd supporting Spurs as the fans shouted insults out to Campbell on the pitch. Campbell enjoyed immediate success with Arsenal, as he won both Premier League and FA Cup winners' medals as Arsenal won the Double in his first season at Highbury. In the FA Cup final at the Millennium Stadium on 4 May, he played alongside Adams as the team kept a clean sheet in a 2–0 victory over Chelsea. Four days later, they secured the league title with a 1–0 victory over Manchester United at Old Trafford. The 2002–03 season saw Arsenal exit the Champions League at the group stage, but remained on course for a retention of the Double as they reached the final of the FA Cup. However, he missed the end-of-season run-in due to suspension after referee Mark Halsey gave him a straight red card for an alleged elbow on Manchester United's Ole Gunnar Solskjær. The club appealed the suspension but was unsuccessful, and he was forced to miss the cup final as Arsenal defeated Southampton to retain the trophy, though they ended the league campaign in second place. His performances were recognised with a place on the PFA Team of the Year, alongside teammates Lauren, Ashley Cole, Patrick Vieira, Robert Pires and Thierry Henry. "Sol had become one of our main players, and we now had an absolute physical presence and stability at the back. He is monstrous and, with his full power and also his ability to score a goal, you have an outstanding player. With Jens Lehmann, Ashley Cole, Lauren, Touré, they were all winners." Wenger speaking on Campbell and the defence of the Invincibles season. The following season, 2003–04, would be known as "The Invincibles season" as Campbell formed a new partnership with Kolo Touré, with the pair instrumental in helping Arsenal regain the Premier League title without losing a single match. The title was secured with a 2–2 draw with Spurs at White Hart Lane on 25 April. He was named on the PFA Team of the Year for the third time in his career, alongside teammates Lauren, Cole, Vieira, Pires and Henry. Campbell missed the start of the 2004–05 season with a knee injury, and so missed the 2004 FA Community Shield victory over Manchester United. The unbeaten run continued to a record 49 matches before Manchester United defeated them 2–0 at Old Trafford on 24 October in a match that would become known as the "Battle of the Buffet". Referee Mike Riley gave a penalty after Campbell challenged Wayne Rooney, though Campbell would maintain that the young striker had taken a dive. Towards the end of the campaign, Wenger began playing Kolo Touré and one of Pascal Cygan and Philippe Senderos in central defence, and Campbell was benched, leaving him to complain to the manager that Senderos was a "lucky player" who should not be considered good enough to play at Campbell's expense. Arsenal again finished second in the league and won the FA Cup final at Manchester United's expense, though Campbell was an unused substitute in the match. In the 2005–06 season, Campbell was blighted both with injuries and a loss of form. In Arsenal's 3–2 home loss to West Ham United on 1 February, Campbell was largely responsible for West Ham's first two goals before being substituted at half-time at his own request. Unusually, he then left the stadium, not staying to watch the second half. His teammate Robert Pires commented that Campbell was facing a "big worry" in relation to his private life, and Campbell did not make any contact with the club for several days. He left the country and spent a week with a friend in Brussels as he reflected on his life. He resumed training with his teammates on 6 February. Campbell was back playing on 25 April in the second leg of the UEFA Champions League semi-final against Villarreal in Spain, where a 0–0 draw on the night put the Gunners into the final. In the final against Barcelona at the Stade de France, Paris, Campbell scored the opening goal, a header from a free-kick taken from Henry after a foul on Emmanuel Eboué. However, ten-man Arsenal went on to lose 2–1, although Campbell was at least involved in the best defensive run of any team in the history of the competition, with opponents failing to score against Arsenal in ten consecutive matches and a total of 995 minutes. Campbell also holds the distinction, alongside Teddy Sheringham, Steve McManaman, Steven Gerrard, Frank Lampard and Wayne Rooney, as one of six Englishmen to have scored in a Champions League final. In July 2006, Campbell left Arsenal by mutual consent in order to seek "a fresh challenge". Campbell before a Portsmouth match in 2008. Campbell was courted by Italian club Juventus, but manager Didier Deschamps eventually ended contract negotiation. Campbell then rejected an approach from Turkish side Fenerbahçe. Instead, he remained in England joined Premier League club Portsmouth, signing a two-year contract in August 2006. His time at Pompey started well, as he formed a successful partnership in the centre of defence with Linvoy Primus and helped the club to keep five consecutive clean sheets. He scored his first goal for the club in a 3–1 win over Sheffield United on 23 December. He was named as captain for the 2007–08 season by manager Harry Redknapp, and signed a new two-year contract with the club. He captained the club to at a 1–0 win over Cardiff City at Wembley Stadium in the 2008 FA Cup Final. The club went into severe financial difficulties, and Redknapp resigned, but Campbell stayed and helped the club to avoid relegation in the 2008–09 campaign. In January 2010, Campbell sued Portsmouth for £1.7 million in unpaid image rights and bonus payments. I enjoyed my spell at Portsmouth; it was like going back to a different time. Everyone was up against it, mucking in. —  Campbell enjoyed his time at the club. Campbell signed a five-year deal with League Two side Notts County in August 2009. Campbell said that County, who had recently been the subject of a takeover by a Middle Eastern consortium, were the best club for "where I am at the moment in my life", and that the recent appointment of ex-England manager Sven-Göran Eriksson as director of football played a "big role" in his decision. He made his debut for County in a 2–1 defeat to Morecambe at Christie Park on 19 September. He walked out on the club three days later, and his contract was cancelled by mutual consent on 24 September. He later admitted he felt embarrassed and that "I was being a mug" in believing the club's owner's were ambitious billionaires who intended to take the club into the Premier League. Campbell marking Stoke City's Ryan Shawcross in 2010. Campbell began training with the Arsenal side in mid-October 2009 in a bid to maintain his fitness ahead of the January transfer window. On 15 January, he re-signed with the club. It was announced he would wear the number 31 shirt. Nine days later, he made his second debut for the Gunners in an FA Cup defeat to Stoke City. On 18 February, he scored his first goal in his second stint at the club with a headed goal against Porto in the first leg of the UEFA Champions League round of 16. Due to injuries to Thomas Vermaelen and William Gallas towards the end of the season, he found himself starting frequently for Arsenal. Sol Campbell playing for Newcastle against Chelsea in 2010. 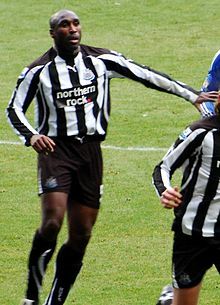 In July 2010, after turning down an offer of a two-year contract with Scottish club Celtic, Campbell joined Newcastle United on a one-year contract. He made his first appearance for the Magpies in a League Cup win over Chelsea on 22 September. On 3 October, he made his Premier League debut for the club as a 38th-minute substitute for Fabricio Coloccini in a 2–1 defeat to Manchester City at the City of Manchester Stadium. In doing so, he became only the second player after Ryan Giggs to play in the first 19 seasons of the Premier League. On 28 November, Campbell made his first Premier League start for Newcastle against Chelsea, and was given the captain's armband after Shola Ameobi was substituted. Campbell started again in Newcastle's next two fixtures with West Bromwich Albion and Liverpool, but lost his place upon the return of Coloccini. After a long period out with viruses, Campbell returned to bench duty in January, making his first appearance in two months as a substitute in Newcastle's 2–0 win over Birmingham City on 15 February. In May 2011, manager Alan Pardew announced Campbell was a free agent after the club opted not to renew his contract. Campbell announced his retirement from football a year later in May 2012. Campbell was a regular through the various England youth teams, and picked up two man of the match awards during the 1993 UEFA European Under-19 Championship which England won with a 1–0 win over Turkey. Campbell made his international debut as a substitute against Hungary on 18 May 1996. Although he had only one cap by the time Terry Venables selected his squad for UEFA Euro 1996, Campbell made the squad as defensive cover. He won his second cap in England's 2–0 group stage match against Scotland, again as a substitute. "When I put on the England shirt, I had a collection of thoughts. It was like going into battle, fighting for your team and your country. I would think that I'm playing against the best players in the world and would love that I could master them, control them and nullify them." His international career was an immense source of pride for Campbell. Over the next two years, under new manager Glenn Hoddle, Campbell became a regular member of England's defence, partnering Gareth Southgate and Tony Adams. On 29 May 1998, aged 23 years and 248 days, Campbell became England's second-youngest captain after Bobby Moore in a 0–0 draw against Belgium, though Michael Owen subsequently overtook Campbell after captaining England against Paraguay in April 2002. Campbell started all four of England's matches in the 1998 World Cup. During the 1998 World Cup, Campbell was involved in a highly controversial incident in England's second round clash against Argentina. With less than ten minutes to play, the score was 2–2 and England were down to ten men after David Beckham was sent off. Campbell headed a corner into the Argentine net and wheeled away to celebrate his first international goal, which appeared to be the winning goal which would have put England into the quarter finals. However, the referee disallowed the goal after ruling that Alan Shearer had illegally contacted the goalkeeper, and England eventually lost the match on penalties. Campbell was England's first choice centre-back throughout the successful qualification campaign for Euro 2000 under new boss Kevin Keegan, and played in all three group games at the tournament, which England exited after defeat by Romania. After the retirement of Tony Adams, Campbell partnered Rio Ferdinand in England's successful qualification campaign for the 2002 World Cup, held in Korea and Japan. He scored his only senior international goal at the tournament, a header off a corner kick by Beckham in the opening group game against Sweden. The match ended 1–1, but in their next match, England defeated Argentina 1–0. Campbell's partnership with Ferdinand was an integral part of a strong defensive performance throughout the tournament, and he was the only England player to be named in the FIFA World Cup All-Star Team. England progressed to the quarter-finals, where they lost to eventual winners Brazil despite playing the last 30 minutes against ten men. Campbell maintained his place in the centre of defence as he took part in England's successful qualification campaign for Euro 2004. England went on to reach the quarter-finals clash with hosts Portugal, and with the score tied at 1–1, Campbell won a header in the opposition six-yard box to score what seemed to be a late winner for England. However, referee Urs Meier decided that John Terry had pushed Portuguese goalkeeper Ricardo and instead gave a free-kick. The game ended 2–2 after extra time, and England lost the penalty shoot-out. Campbell continued to play for England after Euro 2004, although his place in the international team had become less secure since the emergence of the central defensive partnership of Terry and Ferdinand, which blossomed during Campbell's period of absence with injury in 2005. He was named in England's squad for the 2006 World Cup, but was third-choice centre back, with coach Sven-Göran Eriksson preferring the partnership of Ferdinand and Terry. However, after a knock to Ferdinand, Campbell came on as a substitute in England's group match against Sweden, which made him the first player to represent England on the pitch at six consecutive international tournaments. After Eriksson's resignation, new coach Steve McClaren choose to look elsewhere for central defensive strength and Campbell was dropped for his first match in charge against Greece in August 2006. After injuries to Ledley King, Jonathan Woodgate and Michael Dawson, along with Jamie Carragher retiring from international football, Campbell was recalled to the national team. He played four matches under McClaren as England's qualification campaign failed. New head coach Fabio Capello did not select Campbell for his first squad in January 2008. Campbell enjoyed a fine run of form on his return to Arsenal and had retained hope of making it to England's squad for the 2010 World Cup, which would have been his fourth outing on the world stage along with a record seventh major tournament for his country. However, he was not named in Capello's 30-man preliminary squad, with the coach opting instead for Carragher and King among others as potential defensive cover for Ferdinand and Terry. On 30 January 2017, Campbell was named as Dennis Lawrence's assistant manager, after the latter was appointed manager of the Trinidad and Tobago national team. Campbell was appointed manager of Macclesfield Town on 27 November 2018, then bottom of League Two. Regarded as one of the best English centre-backs of his generation, Campbell was a strong, athletic and imposing defender, with a good positional sense, and was also a strong tackler. Due to his height and physical power, he excelled in the air, both offensively and defensively, although he initially had to work hard to improve his heading ability during his teenage years. He did not possess good natural stamina, but had pace, power, agility and quick feet, as well as significant mental strength. Due to his versatility and range of skills, as well as his ability to carry the ball out of defence and get forward, he was also capable of playing as a right-back on occasion. However, despite being fairly comfortable in possession, he frequently drew criticism throughout his career for his poor distribution. Since his retirement from football, Campbell has become increasingly vocal about British politics. In 2013, he said he liked "the mentality of Labour but the policies of the Conservatives". In 2014, he criticised Ed Miliband's proposals for a mansion tax on properties worth over £2 million, calling it "madness". He has also stated he is considering joining the Conservative Party and would be interested in helping the party gain more of "the black vote". Campbell has criticised the racial diversity in The Football Association ("FA"), and he made newspaper headlines in March 2014 after claiming that institutional racism on the part of the FA meant he was never chosen to captain the England team during his playing career. Campbell had been named as starting captain for England in a friendly against the United States in May 2005 under Sven-Göran Eriksson, he was replaced with Zat Knight at half-time following an ankle injury. In February 2015, Campbell confirmed his intention to run for the Conservative Party nomination for Mayor of London in the 2016 election. In the list of four candidates chosen in July 2015, Campbell was not shortlisted. During the 2016 referendum on whether the United Kingdom should remain a member of or leave the European Union, Campbell supported Brexit. In 2008, Campbell began dating interior designer Fiona Barratt, the granddaughter of Barratt Homes founder Sir Lawrie Barratt. They married in Corbridge, Northumberland, on 17 July 2010. He has a son from a previous relationship with Janet Tyler. Campbell had homes in London and at Hallington Hall at Hallington in Northumberland. In December 2015, Hallington Hall was put up for sale for just under £6 million after being totally renovated. Astaire, Simon (2014). Sol Campbell: The Authorised Biography. Spellbinding Media. ISBN 978-190996403-7. ^ a b Hugman, Barry J. (2005). The PFA Premier & Football League Players' Records 1946–2005. Queen Anne Press. p. 106. ISBN 1-85291-665-6. ^ "Player profile: Sol Campbell: Overview". Premier League. Archived from the original on 30 June 2012. ^ a b c Burt, Jason (9 August 2006). "Inside the mind of Sol Campbell". The Independent. London. Retrieved 19 April 2010. ^ Hytner, David (3 March 2009). "Campbell wants points deducted for fans' abuse". The Guardian. London. Retrieved 3 March 2009. ^ Smith, Paul (1 July 2001). "Football: SOL REACHED FOR SKY AND STRUCK GOLD; Former table tennis". Sunday Mirror. Retrieved 4 October 2014. ^ Hugman, Barry J., ed. (1999). The 1999–2000 Official PFA Footballers Factfile. AFS. p. 352. ISBN 1-85291-607-9. ^ "Arsenal sink rivals Spurs". BBC Sport. 8 April 2001. Retrieved 11 November 2014. ^ Burt, Jason (24 September 2009). "Sol Campbell: tortured soul free for new vanity project". The Daily Telegraph. London. Retrieved 26 September 2009. ^ a b Brennan, Dan (September 2001). "25 Transfers That Rocked The World". FourFourTwo (169). p. 93. ^ "spiked-life | Offside, 23 November". Spiked-online.com. Archived from the original on 30 October 2007. Retrieved 26 September 2009. ^ Dennis, Mick (8 October 2008). "Silence over Sol shames Spurs". Sunday Express. Retrieved 26 October 2014. ^ Bowcott, Owen (20 January 2009). "Four banned from matches over abusive chants against Sol Campbell". The Guardian. London. Retrieved 12 August 2009. ^ a b Hugman, Barry J., ed. (2004). The PFA Footballers' Who's Who 2004/2005. Queen Anne Press. p. 480. ISBN 1-85291-660-5. ^ a b "Sol Campbell's top five Arsenal highlights – starting with leaving Spurs in the first place!". Daily Mail. London. 13 January 2010. Retrieved 19 April 2010. ^ "Arsene Wenger still hasn't forgiven Wayne Rooney for penalty dive". Daily Mirror. 29 January 2010. Retrieved 19 April 2010. ^ "Wayne Rooney: Yeah, I dive – but only on holiday". Daily Mail. London. 9 April 2009. Retrieved 19 April 2010. ^ McCarra, Kevin (3 February 2006). "The strange case of Sol Campbell, still missing in action". The Guardian. London. Retrieved 13 November 2006. ^ "Hansen voices fears over Campbell". BBC Sport. 2 February 2006. Retrieved 13 November 2006. ^ Burt, Jason (9 August 2006). "Inside the mind of Sol Campbell". The Independent. London. ^ "Arsenal offer support to Campbell". BBC Sport. 4 April 2006. Retrieved 13 November 2006. ^ "Campbell attends Arsenal training". BBC Sport. 6 February 2006. Retrieved 13 November 2006. ^ "Trivia: 50 things about the UCL". Espnstar.Com. Archived from the original on 22 January 2013. Retrieved 19 April 2010. ^ "Campbell in surprise Arsenal exit". BBC Sport. 8 July 2006. Retrieved 13 November 2006. ^ "Pompey complete Campbell signing". BBC Sport. 6 August 2006. Retrieved 24 August 2009. ^ "Portsmouth 3–1 Sheff Utd". BBC Sport. 23 December 2006. Retrieved 21 May 2007. ^ "Kanu signs one-year Pompey deal". BBC Sport. 6 August 2007. Retrieved 15 August 2007. ^ "Portsmouth face Sol Campbell lawsuit". BBC Sport. 9 February 2010. Retrieved 20 January 2010. ^ "Campbell seals Notts County move". BBC Sport. 25 August 2009. Retrieved 25 August 2009. ^ "Morecambe Notts County". BBC Sport. 19 September 2009. Retrieved 20 September 2009. ^ "Sol Campbell training with Arsenal squad". Arsenal F.C. 16 October 2009. Archived from the original on 19 October 2009. Retrieved 14 January 2010. ^ "Sol Campbell completes shock return to Arsenal". BBC Sport. 15 January 2010. Retrieved 15 January 2010. ^ "Sol Campbell rejoins Arsenal Football Club". Arsenal F.C. 16 January 2010. Archived from the original on 19 January 2010. Retrieved 19 April 2010. ^ Fifield, Donimic (17 February 2010). "Lukasz Fabianski horror show leaves Arsenal furious and frustrated". The Guardian. London. ^ "Campbell Completes Transfer to Newcastle". Newcastle United F.C. Official Website. 28 July 2010. Archived from the original on 30 July 2010. ^ Dawkes, Phil (22 September 2010). "Chelsea 3 – 4 Newcastle". BBC Sport. ^ Bandini, Paolo (3 October 2010). "Manchester City v Newcastle United – as it happened". The Guardian. London. ^ "Campbell and Kuqi released". Sky Sports. 25 May 2011. Retrieved 25 May 2011. ^ "Sol Campbell: Former England defender confirms retirement". BBC Sport. 2 May 2012. Retrieved 2 May 2012. ^ a b "England Records". EnglandFanzine.co.uk. Archived from the original on 16 October 2014. ^ "England pay penalty again". BBC Sport. 30 June 1998. ^ Burt, Jason (9 August 2006). "Inside the mind of Sol Campbell". The Independent. London. Archived from the original on 6 October 2008. Retrieved 23 May 2010. ^ "Football | Sol retains England ambition". Sky Sports. 6 September 2009. Retrieved 26 September 2009. ^ "Lawrence named Soca Warriors boss". FIFA. 30 January 2017. Retrieved 31 January 2017. ^ a b "Sol Campbell: Macclesfield Town name ex-England defender as manager". BBC Sport. 27 November 2018. Retrieved 12 December 2018. ^ a b "Arsenal Dream Team: 5. Sol Campbell". Arsenal F.C. 28 June 2011. Retrieved 18 April 2017. ^ a b Michael J. Chandler (30 September 2016). "Arsene's anniversary: Top 20 players from Wenger's Arsenal tenure". The Score. Retrieved 18 April 2017. ^ a b "Redknapp Predicts Tough Night for Campbell". FourFourTwo. 14 April 2010. Retrieved 18 April 2017. ^ a b "2002 World Cup Profile – Sol Campbell". BBC Sport. Retrieved 18 April 2017. ^ "Euro 2004 Players to Watch: Sol Campbell". BBC Sport. Retrieved 18 April 2017. ^ Phil McNulty (13 January 2010). "Campbell deal makes perfect sense". BBC Sport. Retrieved 18 April 2017. ^ "Euro 2000 Profile – Sol Campbell". BBC Sport. Retrieved 18 April 2017. ^ Ben Radford (13 July 2000). "Soccernet Euro 2000 – Sol Campbell". ESPN FC. Retrieved 18 April 2017. ^ Godwin, Richard (13 May 2013). "Sol Campbell takes the fight forward: the ex-football star on race, unemployment and those gay slurs". London Evening Standard. Retrieved 12 November 2014. ^ Perry, Keith (2 October 2014). "Sol Campbell 'may work for the Conservatives to fight Labour's mansion tax'". The Daily Telegraph. Retrieved 12 November 2014. ^ "Sol Campbell ready 'to have a conversation' with Conservative Party". The Guardian. 10 October 2014. Retrieved 12 November 2014. ^ Ornstein, David (11 October 2013). "Sol Campbell: FA commission 'should be more diverse'". BBC Sport. Retrieved 8 November 2014. ^ Lawton, Matt (2 March 2014). "Skin colour cost me captaincy, says Campbell... but FA are stunned by Sol's allegations". Daily Mail. Retrieved 8 November 2014. ^ "USA v England as it happened". BBC Sport. 28 May 2005. Retrieved 29 March 2015. ^ "USA 1–2 England". BBC Sport. 28 May 2005. Retrieved 29 March 2015. ^ "London mayoral race: Tories shortlist four candidates". BBC News. Retrieved 26 July 2015. ^ Ashmore, John (3 April 2016). "Former footballer Sol Campbell claims Brexit would help improve English football". PoliticsHome. ^ Sean Hamilton. "Football star Sol Campbell to wed girl who worked for his ex". Daily Mirror. Retrieved 19 April 2010. ^ "Ex-footballer Sol Campbell puts Chelsea penthouse up for sale". PrimeLocation. ^ Hughes, Matt (20 February 2010). "Sol Campbell: I was right to take on Portsmouth". The Times. London. ^ "Games played by Sol Campbell in 1992/1993". Soccerbase. Centurycomm. Retrieved 4 September 2012. ^ "Games played by Sol Campbell in 1993/1994". Soccerbase. Centurycomm. Retrieved 4 September 2012. ^ "Games played by Sol Campbell in 1994/1995". Soccerbase. Centurycomm. Retrieved 4 September 2012. ^ "Games played by Sol Campbell in 1995/1996". Soccerbase. Centurycomm. Retrieved 4 September 2012. ^ "Games played by Sol Campbell in 1996/1997". Soccerbase. Centurycomm. Retrieved 4 September 2012. ^ "Games played by Sol Campbell in 1997/1998". Soccerbase. Centurycomm. Retrieved 4 September 2012. ^ "Games played by Sol Campbell in 1998/1999". Soccerbase. Centurycomm. Retrieved 4 September 2012. ^ "Games played by Sol Campbell in 1999/2000". Soccerbase. Centurycomm. Retrieved 4 September 2012. ^ "Games played by Sol Campbell in 2000/2001". Soccerbase. Centurycomm. Retrieved 4 September 2012. ^ "Games played by Sol Campbell in 2001/2002". Soccerbase. Centurycomm. Retrieved 4 September 2012. ^ "Games played by Sol Campbell in 2002/2003". Soccerbase. Centurycomm. Retrieved 4 September 2012. ^ "Games played by Sol Campbell in 2003/2004". Soccerbase. Centurycomm. Retrieved 4 September 2012. ^ "Games played by Sol Campbell in 2004/2005". Soccerbase. Centurycomm. Retrieved 4 September 2012. ^ "Games played by Sol Campbell in 2005/2006". Soccerbase. Centurycomm. Retrieved 4 September 2012. ^ "Games played by Sol Campbell in 2006/2007". Soccerbase. Centurycomm. Retrieved 4 September 2012. ^ "Games played by Sol Campbell in 2007/2008". Soccerbase. Centurycomm. Retrieved 4 September 2012. ^ "Games played by Sol Campbell in 2008/2009". Soccerbase. Centurycomm. Retrieved 4 September 2012. ^ a b "Games played by Sol Campbell in 2014/2015". Soccerbase. Retrieved 4 September 2012. ^ "Games played by Sol Campbell in 2010/2011". Soccerbase. Centurycomm. Retrieved 4 September 2012. ^ "Campbell, Sol". National Football Teams. Benjamin Strack-Zimmerman. Retrieved 12 December 2018. ^ "Managers: Sol Campbell". Soccerbase. Centurycomm. Retrieved 19 December 2018. ^ "Sol Campbell: Overview". Premier League. Retrieved 16 April 2018. ^ "Barça comeback denies Arsenal". UEFA. 18 May 2006. Retrieved 5 July 2015. ^ "Football: Caskey spurs England to glory: Young Turks are routed as Powell's talented team become European champions: Jon Culley reports from the City Ground". The Independent. 26 July 1993. Retrieved 8 January 2015. ^ a b c "Free Agent – Sol Campbell". Sky Sports. 26 July 2011. Retrieved 8 January 2015. ^ "World Cup Scouting – Sol Campbell". BBC Sport. 12 May 2006. Retrieved 8 January 2015. ^ "Zagorakis named top player". BBC Sport. 5 July 2004. Retrieved 8 January 2015. Wikimedia Commons has media related to Sol Campbell. This page was last edited on 22 April 2019, at 16:34 (UTC).